Experiencing knee bursitis? This means that the bursa which is near your knee joint is inflamed. This can be caused by a hit to the knee, an infection, or frequent pressure to the knee area from kneeling. Knee bursitis can be painful, swollen and make it difficult to walk. Treatment for knee bursitis is rest, ice, compression, and elevation. Wearing a knee brace for bursitis will help apply warmth and compression to the area which can help relieve pain and provide stability. In more serious cases of bursitis, fluid may need to be drained or surgery may be recommended. 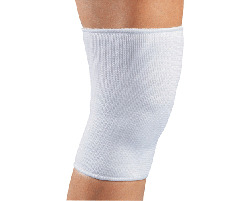 Need help selecting a brace for knee bursitis? Use Brace Advisor, our guided tool for recommendations based on your level of activity and whether you are looking to prevent knee bursitis or already injured with it.